western Cebu wore the colors and excitement of a fiesta on the eve of the canonization of a martyr whom townfolk claim as one of their own. Urbana Calungsod-Mendez, 93 years old, with Fr. Vidal Gornez, a Jesuit who returned to his hometown in in Ginatilan yesterday to celebrate Mass in the St. Gregory the Great parish church to honor Pedro, the 17th century boy martyr whom they believe is a relative. drenched in their clothes, and walked behind an image of Pedro on a flower-covered carriage from the mountain site of St.
Gregory the Great parish church down to the poblacion. Visitors have poured into the seaside town since last week, filling up modest resorts and houses. "Kining lungsora mingaw gyud. Karon lang ni naalegre tungod ni Pedro. Karon daghan nang tawo sa Ginatilan. Dako namo nga kalipay nga santos na si Pedro. (This town is really quiet. It's lively only now because of Pedro. There are so many people around. We're very happy that Pedro will become a saint)," he told Cebu Daily News. Church scholars say Calungsod came from somewhere in the Visayas but lack of baptismal records leave his exact origin a mystery. 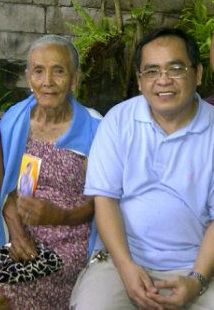 Panay, and Hinundayan and Hinunangan in southern Leyte, wrote Msgr. Ildebrando Leyson, who researched for years on Calungsod's past and prepared the documents for the cause of his sainthood submitted to the Vatican. For Ginatilan resident Verano, recognition by the Pope isn't enough. "Ang importante nga mosunod ta sa iyang mithi. Mag-unsa man ang pagcelebrate kon di nato sundon ang iyang mga maayong mithi. (It is important that we follow Calungsod's values. What good is it to celebrate his sainthood if we don't follow his good examples?)." The town, which compiled records of all Calungsods in a still growing family tree, identified 93-year-old Urbana Calungsod-Mendez, as the oldest of the clan. "Nalipay kaayo ko nga masantos na siya. Amo gyud na siya nga kadugo. (Im very happy that Calungsod will become a saint. We have the same blood)," she said. Mendez said she asks Calungsod to pray that she may continue to have good health and enough food for her daily needs. Fr. Vidal Gornez, a Jesuit priest travelled from his assignment in Manila to celebrate Mass in the church yesterday. A native of Ginatillan, he said the grandmother of his grandfather is a Calungsod, fostering his belief that maybe he, too, has the blood of a heroic Jesuit missionary helper running through his veins. In his homily, Gornez said Calungsod the teenager was familiar with walking long distances. jampacked crowd inside the chruch. "Can we rise to the challenge and be molded by Christian teachings that molded Pedro? It's not enough to claim Calungsod as our kadugo. We have to aspire to walk the same path of his Christian life so Pedro won't be ashamed to call us his townmates," he said. Even in small things like helping others in need, people can do good, said the priest. "Sainthood is for all. We should obey God's will, and love God and neighbor," he added. Today, a High Mass will be held at 10 a.m. in the Ginatilan church, with “barrio fiesta” celebrations in all chapel communiteis. fluvial procession to welcome the new saint.